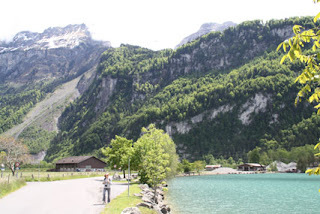 Although weather can be good or bad any time of year in Interlaken in the Bernese Oberland of Switzerland, our visit in late May proved to be just about perfect. It might be a little cool and damp in early morning, but most afternoons sunshine provides the right temperature for hiking, biking, or exploring this city between the Thun and Breinz lakes (hence its name). The boat had plenty of viewing spaces outside and refreshments inside. 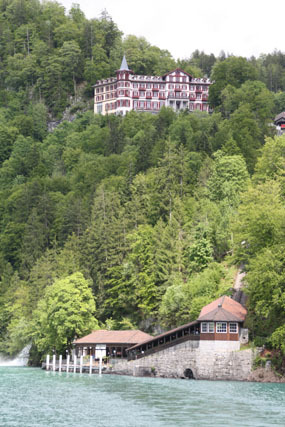 The Grand Hotel perched on a hillside. 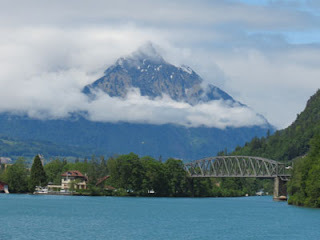 As our boat left the Interlaken Ost dock on Lake Breinz we looked back at an idyllic scene encompassing the city bridge, majestic mountains, and hanging clouds. The boat actually functions as a ferry that criss-crosses the lake, stopping at several small towns about every 10-15 minutes where passengers can get off and on. The first stop was Goldsvil, a small village of perhaps a few hundred people built into the side of a hill (which could be walked to from Interlaken in about half an hour). Another stop was Iseltwald, where several hikers disembarked for their adventures. Larry and I got off at Giessbach, about an hour into the boat ride, to hike to a waterfall. Not knowing where the trail started, we rode on the historic funicular to the Grand Hotel, the only transportation option up a steep path besides hiking. Set atop a hill, the Grand Hotel is a marvelous example of opulence—both for its architecture and the scenery--and many visitors come just to admire the view while enjoying lunch. But we came to see spectacular Giessbach Falls flowing from behind and high above the hotel in 14 stages. 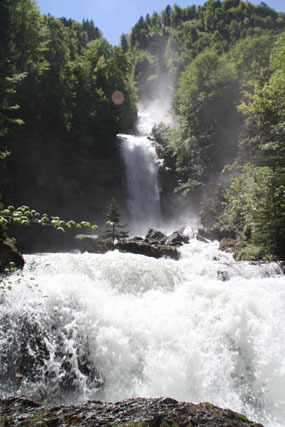 Less than half way up is a spot where the falls are especially gorgeous with water plowing down the mountainside, splashing in a wide cascade and continuing down into Breinz Lake (Breinzsee). We walked up steps and logs to a bridge that goes behind the Falls. Although we felt spray earlier, the bridge was actually not too wet (except the path was slick from the evening’s rain and all the fallen leaves and rotting material on the ground). Although we continued walking higher for a different look, we had already seen the best views of the falls. Infused with energy from the billowing waterfall, the path to Breinz, just over an hour away, was calling to us. 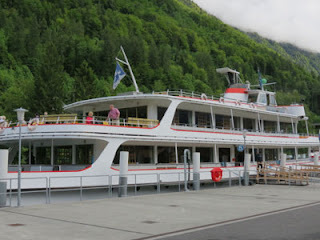 We decided to walk into town and pick up the boat there for our return to Interlaken. We weren’t alone as many bicycle riders were out tackling the hills and curves of this scenic route. After a short walk into town, we saw the boat arriving from across the lake. Since Breinz was the end of the line, we re-boarded and followed the route in reverse, again stopping at small villages while crossing the river in the opposite direction. It was late afternoon, and clouds dropping down over the mountains provided a just touch of solemnity to end our journey.